Background: Sarcoidosis is a multisystem inflammatory disease with an etiology that is not clearly understood. Amongst the different organs that may be affected, the lungs are the most common. Musculoskeletal manifestations of the disease are uncommon. Objectives: They include arthropathy, bone lesions, or myopathy, all of which may occur as initial symptoms or develop during the course of the disease. Methods: Articular involvement my present as arthralgia or arthritis. Skeletal complications usually develop in the chronic state of the disease. Muscular disease is rare and usually asymptomatic. Appropriate imaging modalities including X-ray, MRI, FDG-PET/CT assist in the diagnosis of rheumatic sarcoidosis. However, biopsy is necessary for definite diagnosis. Result and Conclusion: In most cases of musculoskeletal involvement, NSAIDs and corticosteroids are sufficient for symptomatic management. For more resistant cases immunosuppressive drugs (i.e., methotrexate) and TNF- inhibitors are used. 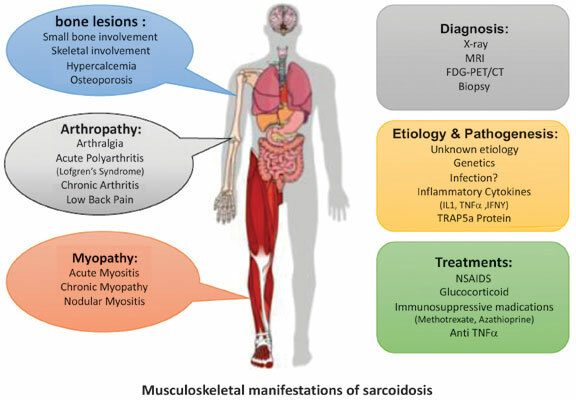 Our aim is to review various types of musculoskeletal involvement in sarcoidosis and their existing treatment options. Musculoskeletal sarcoidosis, treatment options, NSAIDs, immunosuppressive drugs, granulamotous disease, Th1.